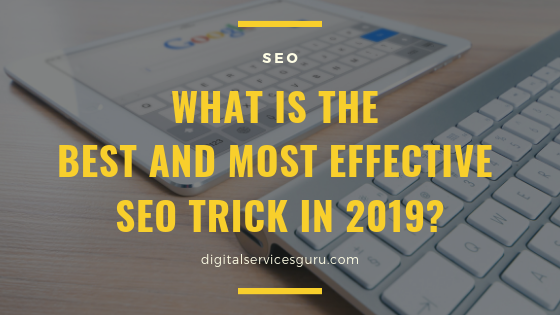 20 Mar What is the best and most effective SEO Trick in 2019? As one of the marketers, you have already searched for various SEO tips. The tips and instructions from different platforms and SEO professionals may make you confused. Now, the question is- What is to be your major focus for SEO campaign? The best answer for this question is that you have to concentrate on your target website visitors. All your efforts for web content and marketing must revolve around them. Now, we have guided you on how to give the utmost value to the visitors. It is the most important thing that gets high values from Google. Google tries to offer the best search results to the users. However, you do not know the real meaning of the term, best. The major fact is that it has to solve the queries of the users. Loading speed- The most annoying thing to a visitor is to wait for a webpage to load for longer time. While your site is slow in performance, your visitors will return to a different platform. Thus, check out the webpage loading speed. Mobile-optimized design- The B2C companies get several visitors from the mobile platforms. However, you can find the use of desktop for the B2B searches. Fluid website architecture- This type of website design helps the visitors to move through the platform easily. The search engines will also identify your pages. This is the best SEO trick for you. You cannot get higher rank just by writing more than 2000 words on your webpage. Your words may not be valuable until they are relevant to the search intent of the users. Find the keywords to reach your targets. There are various tools to pick the right keywords. For instance, you can use UberSuggest to find a list of relevant keywords. SEMRush is also a useful tool to create content, filled with keywords. You have to make sure that the content is easily digestible. The placement of ads in the content or at the ending part of the content may affect the concentration of the visitors. Panda algorithm does not like these distracting items on the design. Link acquisition is one of the major aspects of SEO, and to get the best backlinks, you can focus on relevancy. Another important thing for you is the authority. However, Google has not updated its PageRank, and thus, you may choose other metrics for checking the authority. You can choose Domain Authority to assess the link quality. Relationship building is also the best trick to gain quality backlinks. You can start email marketing to develop trust and affiliation with your target customers. It is also the best way of nurturing the relationship with the present customers of your company. Thus, the most important instruction for SEO campaign is to identify the needs of your web visitors. This will help you to take the right step for SEO.